"The T is silent. Who comes up with these names, anyway?" 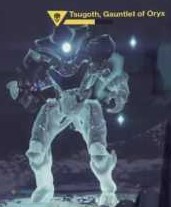 Tsugoth, Gauntlet of Oryx is a Taken Knight leading a Taken Corruption in the Rocketyard in the mission Kings of Decay. It is the first boss of the mission. Tsugoth is one of the only bosses that are big in size but can be disorientated or stunned.